Course Description: Techniques for understanding and analyzing synoptic-scale weather situations, with an introduction to weather forecasting. To demonstrate skills for the analysis of synoptic-scale surface and upper-air observations of the atmosphere. To demonstrate familiarity with the principles underlying the structure, development, and evolution of synoptic-scale weather systems. To demonstrate knowledge of the Norwegian cyclone model and its use as a conceptual framework for the analysis of atmospheric structure at the synoptic scale. To demonstrate knowledge of the methods for determining vertical motion in the atmosphere qualitatively. To demonstrate knowledge of the role of the upper-level flow (e.g., the jet stream) in the development of extratropical cyclones. Note: Meteo 411 is a required course for all undergraduate Meteorology majors. Students who do not meet the prerequisites may be dis-enrolled during the first 10-day free add-drop period after being informed in writing by the instructor (see: http://www.psu.edu/dept/oue/aappm/C-5.html). If you have not completed the listed prerequisites, then consult with the instructor. Synoptic meteorology is the essential link between dynamical meteorology and weather forecasting, theory and applications, mathematics and weather maps. It is foundational for interpreting weather observations and numerical weather prediction model output. It provides the fundamental conceptual insights to the structure and evolution of mid-latitude weather systems, which are linked to nearly all other aspects of atmospheric science at all scales. Students should expect to immerse themselves in following the day-to-day weather. A great resource for this is the Penn State E-Wall (http://mp1.met.psu.edu/~fxg1/ewall.html). Aspiring forecasters may wish to participate in WxChallenge, the National Forecasting Contest. There will be numerous synoptic laboratory assignments, which will typically be given out during the first half of the week, and will be due by the beginning of the lecture session on Tuesday (8 am) the following week. You will always have at least three days to complete a lab. There will be an immediate 25% penalty for any lab handed in late, a 50% penalty after six hours, and no credit will be given for labs handed in after the start of the next class. Professor maintains the right to decline acceptance of a late assignment beyond a certain time. Neatness, organization, technical soundness, spelling and grammar are important. While students may consult with their classmates on these assignments, the final product should represent the student’s own work. Each student (either individually, or as a team) will be required to orally present a weather briefing / forecast discussion to the class. These are around 10-15 minutes in length, and will describe recent weather events and forecasts through the context of the concepts learned in class. The faculty will provide examples of these during the early part of the semester. Weekly quizzes will be given each Friday (except during exam weeks) during the lab session. These will cover topics recently covered in class lectures or the laboratory exercises, and are good practice for the exams. There will be no make-up quizzes, although the lowest quiz grade will be dropped. Two midterms and one final exam will be given. These will be closed-book, individual written assessments. Attendance and Participation: Students are required to attend class (both lectures and labs) and participate in all exercises. Active, thoughtful contributions to class discussions are encouraged. Add / Drop Deadline is September 2. Final exam will be scheduled by the university during exams week (Dec 15 – 19). The course content, topics, and timeline listed here is intended as a guideline, and is subject to modification by the instructors. Lecture notes will often be placed on ANGEL (https://cms.psu.edu), although students are ultimately responsible for their own note-taking. It is reasonable that material covered during lectures, through laboratory exercises, and in forecast discussions may appear on quizzes and tests. Reading the corresponding sections in the optional Lackmann textbook may aid understanding of the course material. Students who miss class for legitimate reasons will be given a reasonable opportunity to make up missed work, including exams and quizzes. Students are not required to secure the signature of medical personnel in the case of illness or injury and should use their best judgment on whether they are well enough to attend class or not. Other legitimate reasons for missing class include religious observance, family emergencies, and regularly scheduled university-approved curricular or extracurricular activities. Students who encounter serious family, health, or personal situations that result in extended absences should contact the Office of Student and Family Services for help: http://studentaffairs.psu.edu/familyservices/. Whenever possible, students participating in University-approved activities should submit to the instructor a Class Absence Form available from the Registrar's Office: http://www.registrar.psu.edu/student_forms/, at least one week prior to the activity. This course abides by the Penn State Class Attendance Policy 42-27: http://senate.psu.edu/policies/42-00.html#42-27, Attendance Policy E-11: http://www.psu.edu/oue/aappm/E-11.html, and Conflict Exam Policy 44-35: http://www.psu.edu/ufs/policies/44-00.html#44-35. Please also see Illness Verification Policy: http://studentaffairs.psu.edu/health/welcome/illnessVerification/, and Religious Observance Policy: http://www.psu.edu/oue/aappm/R-4.html. Academic integrity is fundamental not only to one’s experience at the university, but remains essential throughout one’s career. Students are not to receive unauthorized assistance on any course quizzes or individual assessments. Students are not to misrepresent the work of others as their own. Serious offenses may warrant a zero on the assignment or assessment. Students in this class are expected to write up their problem sets individually, to work the exams on their own, and to write their papers in their own words using proper citations. Class members may work on the problem sets in groups, but then each student must write up the answers separately. Students are not to copy problem or exam answers from another person's paper and present them as their own; students may not plagiarize text from any sources (e.g. papers or solutions or websites) written by others. Students who present other people's work as their own will receive at least a 0 on the assignment and may well receive an F or XF in the course. Please see: Earth and Mineral Sciences Academic Integrity Policy: http://www.ems.psu.edu/current_undergrad_students/academics/integrity_policy, which this course adopts. If in doubt about how the academic integrity policy applies to a specific situation, students are encouraged to consult with the professor or TA. All course materials students receive or to which students have online access are protected by copyright laws. Students may use course materials and make copies for their own use as needed, but unauthorized distribution and/or uploading of materials without the instructor’s express permission is strictly prohibited. Campus emergencies, including weather delays, are announced on Penn State News: http:/news.psu.edu/ and communicated to cellphones, email, the Penn State Facebook page, and Twitter via PSUAlert (Sign up at: https://psualert.psu.edu/psualert/). Students will not be required to attend class if campus is closed during any part of the scheduled class time. Penn State welcomes students with disabilities into the University's educational programs. Every Penn State campus has an office for students with disabilities. 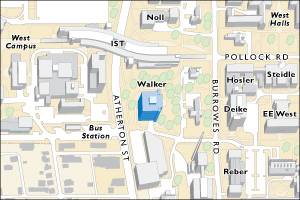 The Office for Disability Services (ODS) website provides contact information for every Penn State campus: (http://equity.psu.edu/ods/dcl). For further information, please visit the Office for Disability Services website (http://equity.psu.edu/ods). In order to receive consideration for reasonable accommodations, you must contact the appropriate disability services office at the campus where you are officially enrolled, participate in an intake interview, and provide documentation based on the documentation guidelines (http://equity.psu.edu/ods/guidelines). If the documentation supports your request for reasonable accommodations, your campus’s disability services office will provide you with an accommodation letter. Please share this letter with your instructors and discuss the accommodations with them as early in your courses as possible. You must follow this process for every semester that you request accommodations. Please note that the specifics of this Course Syllabus can be changed at any time, and you will be responsible for abiding by any such changes. Changes will be posted to the course discussion forum. Acknowledgements: We would like to thank previous instructors of Meteo 411, including Jon Nese, for their contributions to the development and structure of this course.